It’s been years since I paid more than passing attention to baseball, but it happened again this summer. It was a purely selfish thing: the teams that I had followed most avidly, the Cubs and the Athletics, had become perennial disappointments. In the case of the Cubs, they’re deserving objects of ridicule and a model of how weirdly wrong a franchise can go: since they play in a “destination” ballpark, the home nine’s wretched performance on the field has no bearing on the organization’s ability to pack the stands game in and game out. The A’s case is different. Heck, there’s a book and movie out there that explains the general manager’s technique of finding undervalued talent, and he is well known for putting together a roster of kids and cast-offs who win more games than anyone would expect. A less celebrated side of the A’s way of doing baseball is that very few players get to stick around long enough for the fans to get attached to them. Do the A’s have a standout first baseman or shortstop or pitcher? You know that when they’re eligible for free agency, they’ll be gone. So the cast of characters change and change and change, and while the teams the A’s have fielded the past few seasons may have made some sort of economic sense–at least from the standpoint of an owner who wants to take the team to a new city and seems utterly uninterested in investing a dime, or more than a dime–the results have been a little dispiriting for the casual fan and unlikely to win any new converts. 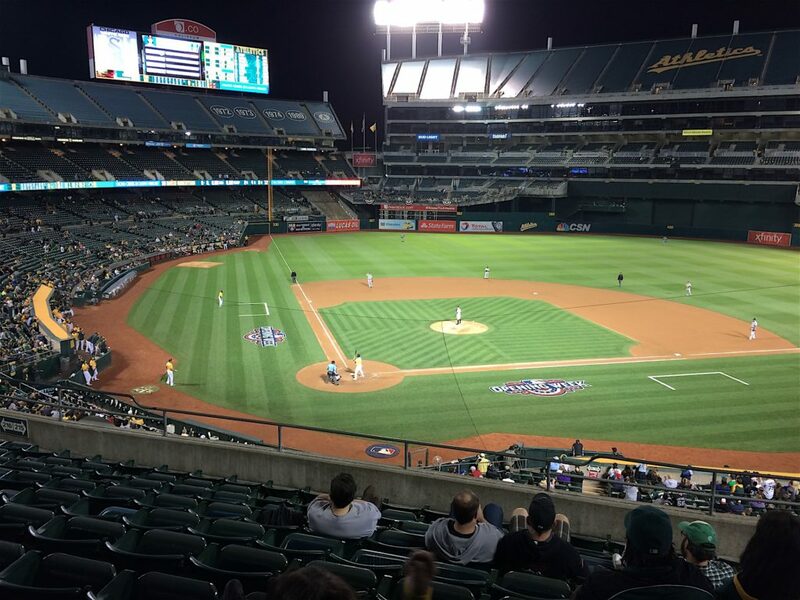 The A’s ballpark, the Oakland Coliseum, has become the opposite of a baseball shrine. The limitations of a multi-purpose stadium were built into the place, but it had its graceful points if you were willing to see them. The park featured a beautiful view to the Oakland Hills to the east (though yes, right in the center of the vista was a working rock quarry). Back in the ’90s, the city and county made a deal to get the Raiders to come back, and part of the deal was to remodel the stadium. The result was a grossly ill-proportioned concrete monstrosity that bans the view of anything that might soothe the eye. So, regular outings to the Coliseum is a hard sell to anyone who’s not already a convinced follower of the local teams. This season? Well, this season was certainly different. The A’s, with the usual collection of odd parts, played their first 61 games in the expected fashion. On June 10, the team was 26-35. From that point on, they won more games than any team in the major leagues, going 68-33. Wow, was that fun to see. And so by August–did I hear someone say, “Fair-weather fan”?–I started going out to see what was happening out at the Coliseum. Major League Baseball’s post-season continues this weekend … with the San Francisco Giants returning home to play the St. Louis Cardinals tomorrow in their National League Championship Series. The Giants go into Game Six against the defending champions … hoping to get back to the World Series … and reclaim the crown they won two years ago. Across the Bay from the Giants’ sparkling ballpark … another team made the playoffs this year. Dan Brekke of NPR member station KQED reports on the surprising Oakland Athletics … a franchise that battles the best in the American League … and sometimes its own fans. Back in early June … this is the last thing an A’s fan would have expected to hear … as the year wound down. The A’s turned a mediocre spring into a summer of conquest. Their roster of unknowns, re-treads, and rookies ended the regular season by sweeping past the Texas Rangers to steal the American League West Division title. And then … on to the playoffs. Ambi: Let’s go Oakland chanting. But … before we continue with that feel-good story, a word about Oakland, the A’s … and Bay Area baseball. The A’s owner … developer Lew Wolff … is determined to take the team to San Jose … build a new stadium … and sell luxury boxes to the Silicon Valley super-rich. So … a lot of A’s fans aren’t crazy about Lew Wolff. There’s little love lost for the Giants, either, who seem to have everything the Athletics don’t: a beautiful waterfront stadium, a sell-out every game, and money to go out and buy top-level talent. Something else the Giants have: the territorial rights to Wolff’s coveted new home in San Jose. So far, they’ve blocked the move. So for now … Oakland fans and Wolff are stuck with each other … in a historic but hideously remodeled ballpark … that ranks near the bottom of the major leagues in attendance. But all that seemed to change … as the A’s made the playoffs … and came home to play the Detroit Tigers on October 9th. But even then … lots of customers were unhappy with management. With fans begging for tickets … the team left 10-thousand upper-deck seats covered with tarps … and off-limits.The A’s explained they wanted to maintain an “intimate” feeling at the game. For fans … it was just another sign that the organization doesn’t care about them. EH: It’s completely insane. […internal edit …]. I understand that during the normal season there might not be enough to fill up those seats. But this game sold out almost immediately, and the idea of having those tarps on there still is completely horrible to the tons and tons of A’s fans that would love to have seats right now. DB: And why do you think they didn’t open it? 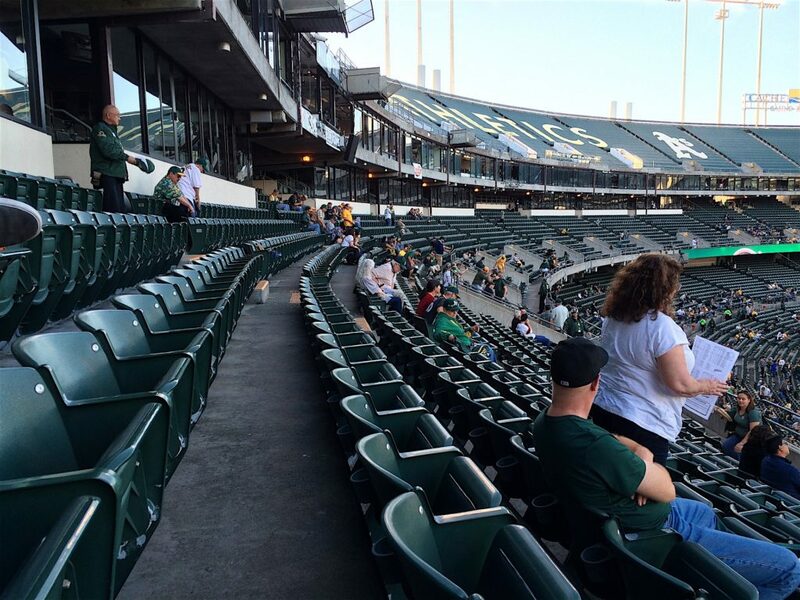 A’s management did relent … announcing it would open the upper-deck seats … for the league championship and World Series. That was before the A’s ran into Justin Verlander in the deciding game of their divisional series match-up with the Tigers. He pitched a shutout … and it turned out the tarps could stay on all winter. Some fans complained Wolff had jinxed the team … by finally agreeing to open the upper deck. But the fans … and the surprising team they had come out to cheer … had a final moment together. As the Tigers celebrated on the infield … the Coliseum crowd gave the Athletics one last ovation. Ambi 5: Out on “Take Me Out to the Ballgame” ambi? (Not sure the song pops enough). For Only A Game, I’m Dan Brekke in San Francisco. Update: The Giants won, and that means they're the first team to come back from a two-nothing deficit at home to win a five-game series with three straight wins on the road. This was the second five-game series (the history goes back to 1969) in which a home team didn't win a single game (the first was Texas-Tampa Bay in 2010, when the Rangers clinched at the Rays' dome). "Arcane baseball research." Is there any other kind? 2012 Giants (vs. Reds; series tied 2-2). 1981 Brewers (vs. Yankees; Yankees won 3-2. at Milwaukee). 2001 Yankees (vs. A's; Yankees won 3-2; fifth game at home). 2010 Rays (vs. Rangers; Rangers won 3-2; fifth game on the road). 2010 Twins (vs. Yankees; Yankees won 3-0). 2008 Angels (vs. Red Sox; Red Sox won 3-1). 2008 Cubs (vs. Dodgers; Dodgers won 3-0). 2007 Phillies (vs. Rockiers; Rockies won 3-0). 2006 Twins (vs. A's; A;s won 3-0). 2006 Padres (vs. Cardinals; Cardinals won 3-1). 2004 Angels (vs. Red Sox; Red Sox won 3-0). 2002 Diamondbacks (vs. Cardinals; Cardinals won 3-0). 2001 Astros (vs. Braves; Braves won 3-0). 2000 White Sox (vs. Mariners; Mariners won 3-0). 1997 Mariners (vs. Orioles; Orioles won 3-1). 1996 Dodgers (vs. Braves; Braves won 3-0). 1995 Rockies (vs. Braves; Braves won 3-1). 1984 Royals (vs. Tigers; Tigers won 3-0). 1981 Royals (vs. A's; A's won 3-0). 1979 Reds (vs. Pirates; Pirates won 3-0). 1979 Phillies (vs. Dodgers; Dodgers won 3-1). 1976 Phillies (vs. Reds; Reds won 3-0). 1974 Pirates (vs. Dodgers; Dodgers won 3-0). 1970 Twins (vs. Orioles; Orioles won 3-0). 1970 Pirates (vs. Reds; Reds won 3-0). 1969 Braves (vs. Mets; Mets won 3-0). *100 5-game series since 1969; approximately 52 with 2-3 configuration. Twenty-five teams have started a five-game series with two games at home and lost both those games. Prior to this year, one won the series 3-2; two lost the series 3-2; five have lost 3-1; 17 have lost 3-0. A week of light posting because, well, there was work to do. I got to do a little radio feature on the San Francisco 49ers for an NPR sports show produced at Boston’s WBUR, “Only A Game.” It was sort of a quick-hit story, and the field reporting involved going to a couple fan bars last Sunday. People were amazingly willing to talk, for the most part, and they were not even liquored up. The folks at WBUR did a very nice job on the story, too. And the MP3 link to the story audio. On the walk to the ferry tonight. When I have time, I like to walk by AT&T Park on the waterfront side. It’s always cool to see the stadium, something of a waterfront jewel, landfill be damned. One of the features along the water frontage is an arcade where you can see into the ballpark from field level–you’re essentially standing just behind the right fielder. During the season, fans are welcome to take in the game for free from that vantage point; your turn lasts three innings if it’s crowded, and it’s nearly always crowded. A ballpark after the season ends is a different story. Melancholy, a place deserted by everyone and everything that gave it purpose. The spaces, those unfathomable distances, are voids. No arcs or parabolas there. Until that changes, which they say happens next year, if we wait.